Tonite I'm in Celina, OH waiting for my favorite restaurant (The Fountain) to open at 4:30am. I may not (read WON"T) be there that early but later when my retired local farmers come in for their morning coffee I'll join them for breakfast and some chat. I enjoyed Riding with new friends this week. Good to see Larry M again. Last saw him on a Darksiders gathering quite some years ago. Think he's going by the handle "Clem 70" on this board? Well I made it home safe and sound. The ride home was nothing short of awesome; great weather and even better roads. I stretched out 300 miles to almost 8 hours. Ran 60 out of Marietta North of where we were and then headed Northeast on the back roads (state and US routes, not the gravel ones....LOL). I had a great time and it was nice meeting everyone and enjoying some of the best riding Ohio has to offer. Hope everyone made it home safe. Home safe and sound. 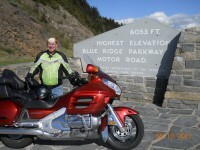 A little over 400 miles today including a great ride thru Ohio led by Dave Hyatt. We rode over to Athens Ohio then took SR 56 northwest to Circleville. Another great route among many. From there Dave led us thru Columbus and into Delaware ( Thank the good Lord for a local guy to get us thru). After enjoying lunch with Dave we said our good byes and Corky and I continued north thru Ohio till Corky split off in Perrysburg. I rode solo the last 125 miles. A great Gathering. Already looking forward to next years Gathering. I left the hotel at 9:20, and saw detdrbuzzard (William) packing his bike up getting ready to ride. I decided...hey, 555 is right along my route, why not ride it from bottom to top? So that's just what I did. I hopped onto it and rode the length of it, which took almost exactly two hours. When I arrived in Zanesville, I considered stopping for lunch, but wasn't quite hungry yet. I stopped for a pit stop in a gas station, and when I came walking out, who did I see zooming past? 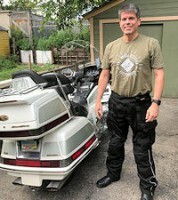 detdrbuzzard on his ST1300! What are the chances? I jumped on my bike and hightailed after him, but traffic and two red lights got in the way, and he managed to elude me. Ah well! From Zanesville I took 70 over to 83, and then 83 all the way up through Coshocton to 71. 83 has some good spots to it, but a lot of the road condition is not as nice as it used to be. It got up to about 85 degrees, not too hot. A really nice ride, and it was great to ride the full length of 555. It was also great to see everyone! Some great rides, fun and people. I'll take some time and start pulling video later this week. Arrived home about 5:45, and quite uneventful. Rode to the Ohio River Museum first, had a private tour of the W.P. Snyder Jr. After 3 days of "twisties", Dad(The Grinch) and I are tired. I'll post the few photos I have later this week. Hi folks. Had a great time on the ride in Mineral Wells WV and Ohio, especially offroading with a GL 1800. For the guys on the ride with older GL 1800s, I just ordered the T valve stems from CycleMax but forgot which TPMS you are using. My GL1800A is a 2001 model. Can you let me know which TPMS you recommend. I don't want FOBO as I want to see the pressure as I ride and don't want to keep my phone on the handlebars. Looking forward to seeing you next year on the Third Annual ride. Keep the shiny side up and I look forward to getting your recommendations. Also, Brian, I can't find the SonyCam 8 on the Amazon website. Does it, perhaps, go by another name? Jim, you can use any TPMS system. Browse Amazon (search to TPMS) and you'll find many different types. Nice! I'll have so see if I can beg my way into getting one too. Enjoyed the long weekend very much, in spite of an action packed gravel road detour on Saturday. I was pleasantly surprised to find I still had some level of recall on how to read gravel and dirt pack from back in the late 60s on a Sears moped and later a Honda CB350. Al did a relatively superb interpretation of a "Triple Lindy" when his bike went down..but arose with only a small scratch. Just glad no one was hurt. Got to meet meet quite a few people I had not met before and chat it up a bit as well as those from last year. Larry was a great roommate. 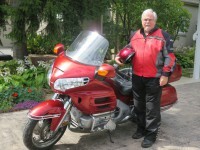 Very interesting guy with lots of great things to share about his many motorcycle travels. Like Al said,we had a great ride home thanks to Dave. I wish I had known about highway 56 years ago. Al mentioned that he might not make it back home by 5 pm, so me and my old girl decided to see if some hammer time might at least give him a chance. Was able to see what she could do for 100 miles or so. 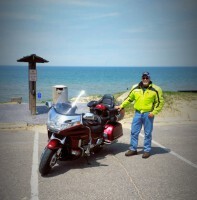 I'm finally Home after stopping at a couple of places in Indiana and another near Hillsdale, MI to see old friends. It was great meeting and making new friends at this the 2nd annual GWDocs Gathering. Looking forward to next years gathering where ever it may be. It was great having Corky as a room-mate. He's a Good Guy! Left at 6:00am and took the freeway. Slept all the way home. A few more pics from the Gathering. Just a few more pics from the Gathering. What about Wanda? She's wearing a fan. Just a note to say thanks for a good time and getting to meet all of you. Great rides, good planning, and always fun to have an unexpected adventure. Those 'Wings can off-road!! If you purchase them, the installation is fairly easy if you are somewhat mechanically inclined. SoCal has great videos and lots of assistance if needed. Toughest part for me was removing the stock flashed unit and replacing with the LED flasher unit. Tight mounting place behind the windshield mounting. Just to settle a beer argument. Pleased to hear everyone has returned home safely. Like William and Scott, Al, Corky and I just had to get a few more miles of twisties through the woods to cap off a great weekend. Probably a good thing we hit the biscuits and gravy afterwards! Next year's gathering sounds good so I already have it penciled in. 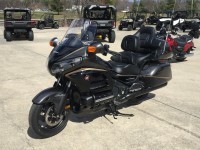 I have to believe there is a lot of good riding weather left this year so I will give a shout out when I just have to hit the road for that special burger, fried chicken or BLT so any and all can join in. Al pegged it when he said I haven't missed too many meals! Dave, thanks for showing us the back roads from Mineral Wells to Delaware! My daughter graduated from OU a few years ago and there were many times I wish we would have taken that route instead (although the wife might have gotten a bit carsick on the twisties). Avoid carsick at all costs! It was a pleasure to ride with you. Thinking a return ride in another couple weeks might catch fall foliage along the route. Interesting review of the SJ8 cam shown above. 0 out of 5 starsDO NOT BUY AN SJCAM!!!! Absolutely Horrible. Don't by from SJCam!!! First of all, it has many issues with quality. It is overpriced based on these issues. SJCam provides the worst support of any company I've dealt with. They've basically asked me to install older versions of hte Firmware which resolves some issues but then introduces others. They had me go back from v1.21 to 1.20 to 1.18 to 1.15. That is all they've done and they can take up to 2 weeks to respond to you. Why should I install older firmware. The idea of updating firmware is to improve the product and add new features. Here are some of the issues. BTW, look it up and many people have the same complaints. It gets so hot that you cannot touch it. It has gotten so hot that it shuts down. I've heard of many melting. 5. I have the SJCAM Remote Watch and half the time it won't work so I don't know if I am recording or not when it's on my chest or head.